The fabulous Fun Furniture craft table is available in 2 sizes, large and small, the ideal solution if space is at a premium!. 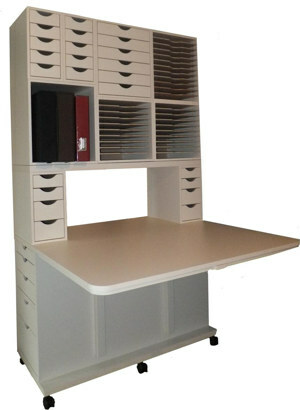 Tables have a large drop side work area that is simple to lift and lock into place. When you have finished, it is easily released to drop down again out of the way. 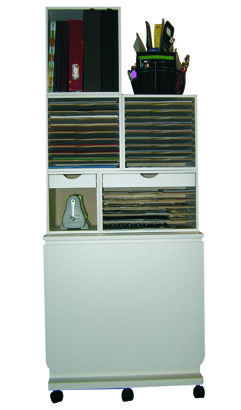 Tables come with 2 cubes underneath each end and these are available in any configuration of drawers and/or shelves. If you need to extend your storage capacity, why not purchase additional cubes to stack on top of your table? The large table also comes with the option of adding a stacker board allowing you to keep a flat area in use even when your table is folded down.